On 11th day of the bright half of Margshirsha in the month of November- December people from faraway places assemble on the holy land of Kurukshetra to take a sacred bath in the tanks of Brahma Sarovar and Sannehit Sarovar. The interesting and striking celebration of Kurukshetra festival continues for one week. Shloka recital, dance, dramas and daan (charity) are the integral parts of the celebrations. 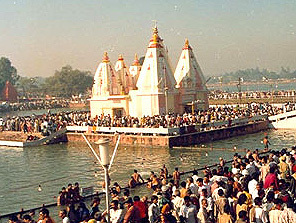 Cultural and religious programs take place around the devout land of Brahma Sarovar. Free medical camps, book exhibitions and bhajan recitals are organized. These are the classical and ancient traditions of the festival. The Gita is read and recited on this auspicious day of Kurukshetra festival. People find themselves busy in worshipping the Gita and Krishna. People of Punjab try to follow the directives and spirit of the Gita earnestly.